While many companies trumpeted their low prices for Black Friday, the company behind popular party game Cards Against Humanity raised its prices and gleefully advertised the change. And you know what? The $5 price increase was a hit. Social media and other outlets buzzed about the move. Customers seemed tickled, too. Sales reportedly improved over last year. "Anyone can do a sale for Black Friday, but nobody but us could get away with raising their prices and risking a ton of sales just to make a joke," Cards Against Humanity co-founder Max Temkin wrote on his blog. Cards Against Humanity is a game in which players draw cards with random questions such as "What will always get you laid?" Other players try to respond with the funniest answer provided by another set of cards. "Cards Against Humanity is as despicable and awkward as you and your friends," the website cheekily declares. Amazon, which sells the cards, was both amused and annoyed when CAH made its intentions known to bump the game's usual $25 price up to $30 for Black Friday, Temkin wrote. But in the end, counter-intuitive reasoning won out. "BLACK FRIDAY BLOWOUT SALE! 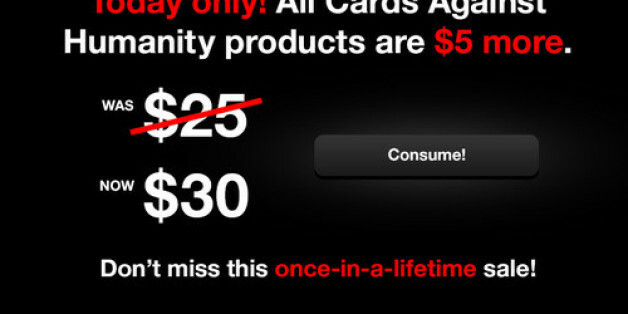 Today only, all Cards Against Humanity products are $5 more! Drop the turkey leg, get out your wallet, and get in on this once-in-a-lifetime deal!" the company chirped on its Facebook page on Nov. 29. "[T]his is why [I] f---ing love you guys," one Facebook visitor wrote. Another said, "Please release a promo code so I can get this deal all year round?" Then came bleak Saturday, when the company announced: "Okay, that's it. Our Black Friday promotion has ended and unfortunately all our products are now available again at their regular, stupid every-day prices. Have a good weekend, everyone." In the end, Cards Against Humanity slightly increased its sales over the previous year, Temkin noted on his blog. "We kept our position as the best-selling toy or game on Amazon. My guess is that peoples’ buying decisions just weren’t that affected by $5."